I went in looking to buy a 2008 Highlander Hybrid base model with the third row seat in red or green. The salesman, Jose, was very nice but oviously was lying when he said there "are no such vehicles within a 300 mile radius." So I said I'd accept the silver Limited model they had if we could come to an agreement on my trade and terms. Ernie, the sales manager, looked at my papers briefly, came over and said, "You can't afford this vehicle ma'am. You need a nice Sienna." He assured me that my trade that I paid $20,000 cash for-- to THEM-- just 18 months earlier was only worth 4000.00. I told them I didn't want a Sienna--I wanted to keep my car or get a hybrid--period. I went right home and began shopping online. I connected with the fleet manager at a dealership in Moreno Valley. Just 2 days later, I am a proud owner of a green 2008 Highlander Hybrid that I LOVE!! I got a great deal that I am happy with. 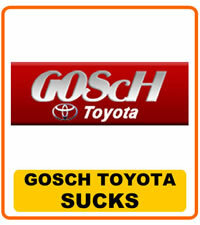 I'd love to drive by Gosch and have someone moon them out the window of my lovely new vehicle!